Did you pick yours up last week for $550? Just as I predicted, it went on sale before bouncing right back to nearly $700. It is a rare from Legends on the reserve list. It is being used in multiple Legacy decks to keep creatures and mana under control. I would not by them at $680 but if you want to play with them I would still try to see if any copies exist in the $550 range before that omission is corrected. Can I say how much I love this card? She is powerful, evasive and has protection from pesky cards like Path to Exile, Detention Sphere and Remand. She is used in Commander, Casual formats and has been showing up recently in Modern decklists. Play her morphed. For the small price of a Cloudshift, Flickerwisp or Restoration Angel (remember she is not an angel while morphed) you get a 6/6 monster in the air. She can block Archangel of Thune all day long and not trigger any lifegain or counters. She is being experimented with in Birthing Pod and Death and Taxes variants. I would trade for her before Modern season gets going. I could easily see her getting to $10 if the decks perform well. She has only been printed twice: in Planar Chaos and the original Commander decks. For flavor and mechanical reasons I don’t think she will ever be printed again outside of a supplemental product. Wizards of the Coast printed the Mind Seize Commander deck with two money cards in it. True-Name Nemesis was worth more than the retail price of the deck and Baleful Strix was just icing on the cake. This left a lot of financiers with ninety eight cards needing a home. Nekusar, the Mindrazer was an interesting card with a powerful effect that was included. 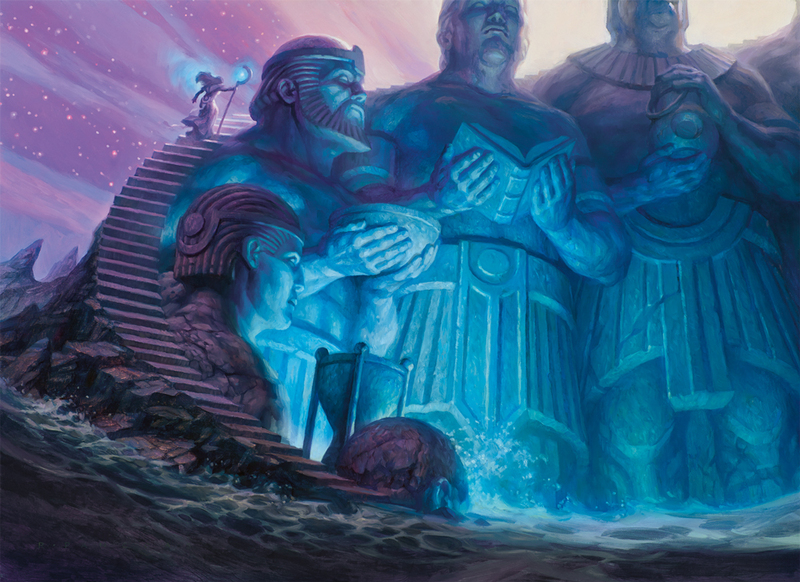 A little tweaking was needed and Nekusar decks have been causing price increases in Forced Fruition, Winds of Change, and even the innocuous Teferi’s Puzzle Box has become a powerful win condition. This card is spiking despite five printings and the support of a format where one copy is all a deck needs. Every copy of this card is being sought out to complete Nekusar decks. Trade for them if you can get them for under $2. Your local game store may even have some in their bulk rare boxes. This rare from Tempest is on the Reserved List. For five mana it lets a red deck exile the entire board. Think about what that means in a casual game. Hexproof and Indestructible permanents make you laugh. Undying and Persist creatures mean nothing to you. Even Gods and Planeswalkers must leave at your command. All it costs is your hand. This is a sweeper worth having. I would actively trade for these. I can only see these continuing to grow slowly over time due to casual appeal. Did you remember that this card exists? I had to look it up. It is a budget Commander with an interesting effect. It is a rare from Ice Age which means there are not a lot of copies lying around. He is on the Reserved List so it will never be reprinted. Last summer it shot up from $2 to $10. It sat around $8 for over a month before slumping back to $2. It is a pretty cheap spec with some interesting potential. I would try to trade for these if you see them in binders. They will probably be sitting with the bulk rares. This Commander all star card has been inching up recently. It is not hard to see why. It can be played in any deck since it has no color requirement. It can exile a problematic creature that you don’t want your opponent to reanimate. It can be a steady stream of card advantage. Even something as mundane as exiling an opponent’s evoked Mulldrifter will give you a Divination you can cast over and over again. You can chump block forever and keep reaping the benefits. The best part is that if something better comes along like Thragtusk or It That Betrays you can upgrade. If you want to play with it, I would pick mine up sooner rather than later. The Imprint mechanic makes it difficult to reprint outside of a supplemental product. This will probably be a slow grower a long time to come. Standard has been experimenting with Reanimator decks in Golgari and Junk configurations. The decks have been playing well and one of the best targets to reanimate in Standard is Shadowborn Demon. It kills an opposing creature like Master of Waves or Stormbreath Dragon and then swings in for five in the air. If you used Whip of Erebos to bring it back you do not even need to worry about the upkeep trigger. If you are playing with them then by all means enjoy them. Otherwise I would try to trade them for some Scrylands or gods. Rotation is just a few short months away. Fall will see Shadowborn Demon as a bulk rare that will clutter your binder for years to come. Get something with a longer shelf life. Did you grab your Judge Promo yet? Sneak Attack was briefly $85 for both the regular version and the Judge Promo. This should never happen for a card that is used as a full play set main deck in a Legacy deck. I honestly have no idea how this happened. I would not get into Sneak Attack now. I think this price adjustment has been coming but the time to get it for less than $50 has passed. Through the Breach is $10 and sometimes gets played as additional copies of Sneak Attack. It was under $5 for a long time so price memory can help you when picking up copies. Sigil of the Empty Throne just keeps picking up steam! Monowhite and Azorius Prison decks like to hide behind Porphyry Nodes and Detention Spheres until they can land a Sigil of the Empty Throne. Weekly results of MTGO Modern tournaments have not seen these decks place very competitively recently. Modern season is coming soon and a lot of people are probably brewing with these as a budget deck. They are fun to play with but the price is not supported by results. I would trade these away. I do like Detention Spheres and Chalice of the Voids from these decklists though. Both are cheap and relatively easy to pick up. They are both used in multiple formats as four ofs in multiple decklists. They are criminally underpriced. This Junk (Green / Black / White) Commander has only been printed once. It was available as part of the original Commander decks. There has been a lot of interest recently in obtaining these Commanders. Supply is low and interest in the Commander format is at an all time high. This cheap pick up was suggested by myself (and much more significantly Jason Alt) last week. The price shot straight from $2 to $12 in an instant. It is coming down but I think it will settle around $7 to $8. I would sell or trade your while it is still high. There are still some cheap Commanders from the set that have room to grow. Karador, Ghost Chieftain and The Mimeoplasm can both be had for $5 to $6. Ruhan of the Fomori and Zedruu the Greathearted are both bulk rares at this point! You could probably get both as toss ins on trades. Edric was a surprise inclusion in a successful 4 Color Delver Legacy deck a couple of weeks ago. The problem is that the deck only wants one copy of him. The deck made a Top 8 appearance in Detroit last week but that alone is not enough to support the card’s sudden jump from $4 to $20. It is still a strong card with low supply. It has only been printed twice: Commander and Commander’s Arsenal. I think it will settle around $12. You will notice a trend for the losers of the week. Pre-order prices for Journey into Nyx gods have all been adjusted. It is what happens when you combine Erase and Lobotomy. Keep in mind that this does not mean the gods are bad cards. Keranos is fantastic in a Grixis control strategy. I would still first pick just about any of the gods over a Deicide in a draft. The Journey into Nyx gods have all will have to settle after they are released and Standard has a chance to play with them. They are third set mythic rares so they should settle higher in price than the gods from Theros or Born of the Gods. This one surprises me. I am cautiously optimistic. It is not only used in (and names) the White Prison decks mentioned before but it is used in many control variants in Modern. The thing that keeps this down is the fact that it was printed as an uncommon and it has been printed four times. I would target the FNM Promos. I think that it will recover. The card should be significantly higher in price than Sigil of the Empty Throne. This one saddens me but it now makes Kruphix the one god who I think will hold its prerelease price for its duration in Standard. This is sure to be a favorite Commander for a long time to come. I would gladly trade for these at $9 this weekend. The increase in demand for Teferi’s Puzzle box can’t be more than the copies of Nekusar, so there’s a clear cap. There’s far, far more supply than Forced Fruition. You are absolutely right. That is part of why Forced Fruition is worth so much more than the Puzzle Box. I was equating the cause for the sudden interest. I like the idea of recapping winner and loser each week. Will be better if you separate between STD and modern format since the price of STD will fluctuate so much especially during the honeymoon period. Thanks for reading! I am glad you enjoyed the article. Would you be interested in seeing a few of the cards from each format that grew or shrunk the most?